Great rates. **** We ONLY rent WEEKLY (Saturday to Saturday OR Sunday to Sunday) OR MONTHLY. Very Clean & Well Maintained. $200 security deposit is required. Free Wifi and highspeed internet. KING size bed. Top 3rd floor, end unit - NO elevator. Please refer to our vacation calendar for availability. Great Rates,well maintained AND tastefully decorated what more could you ask for. WiFi and 2 flat screen tvs (42 inch LED flat screen TV in living room, smaller flat screen in master bedroom). 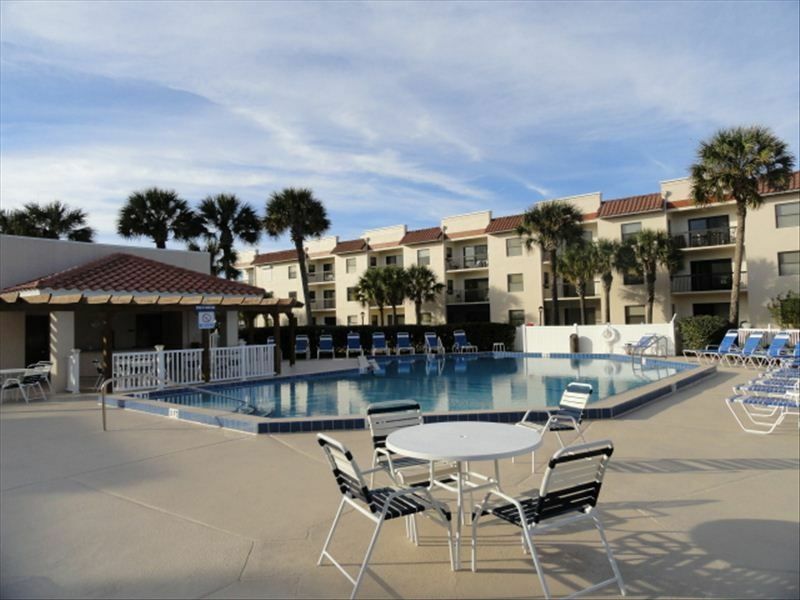 Two pools (one heated during winter), FREE TENNIS, shuffle board, and wide sandy beach! Club house with library, computer (DSL) and exercise room. DSL and WIRELESS are available in our condo, (must have your own laptop). Located in prestigious Ocean Village Club, an oceanfront gated community. Ocean Village Club is located on Anastasia Island in historic Saint Augustine, the nation's oldest city. Ocean Village Club offers the best amenities for year-round fun and relaxation. Our tasteful two-bedroom, two-bath condominium is located on the top-floor of the G building, a third-floor (walk-up), end unit ensuring an abundance of light and privacy. The condo overlooks the tennis courts and heated pool. A short walk takes you to the private walkway to the wide sandy beach (no roads to cross). The unit is completely and comfortably furnished for your enjoyment, including bed/bath linens and a fully-accessorized kitchen, including washer/dryer. The master bedroom has a king-size bed, Flat Screen TV with cable, its own bathroom, walk-in closet, and sliders to the balcony (over looking tennis courts and heated pool). The second bedroom has twin beds and plenty of closet space. There is an additional bathroom just off the second bedroom. The dining area includes a table which seats six. Connected to the dining area is the living room completely furnished including sleeper sofa, cable TV, DVD player, as well as sliders leading to the balcony. The balcony is furnished with a table and chairs perfect for relaxing and taking in a tennis match while sipping a cool beverage. FREE DSL and WIRELESS are available in our condo, (must have your own laptop). Your adventures while staying at Ocean Village Club are limitless... you can SUN, SWIM, PLAY TENNIS, FISH, SURF, GOLF, SHOP, visit Disney or other nearby sites, or just RELAX. SITES - When not relaxing on the beach, you can visit the fabulous historic city of Saint Augustine, the oldest city in the nation, just 15 minutes away. While in Saint Augustine, you can enjoy historic sites, fabulous shops, and fine restaurants. In Saint Augustine you can enjoy the famous Castillo De San Marcos Fort (17th-century fortress), the Alligator Farm, Fountain of Youth, Potters Wax Museum, horse-drawn carriage rides, San Sebastian Winery, and so much more. SPORTS - Besides the FREE on-site amenities (two pools, tennis courts, and shuffleboard) you can partake in surfing, fishing, boating, and of course Golf all located close by. Ocean Village Club is centrally located to several fine golf courses including Sawgrass/Ponte Vedra (TPC), and World Golf Village where you can also take in the World Golf Hall of Fame and an I-Max movie. The owner lives in St. Augustine and is happy to give you tips on restaurants, shopping, golf etc. We love St. Augustine and enjoy sharing our condo with visitors from all over the world. We’ve lived in several places throughout the years but came back to settle permanently in St. Augustine. In our travels, we have rented through VRBO and understand the importance of providing high quality service, cleanliness and maintenance for guests. We personally manage our condo to ensure that you have a wonderful stay. Our condo association is the best in the area and ensures that our common areas are superbly maintained. We hope you enjoy our condo “your home away from home” and the oldest city that we love, St. Augustine! Our condo is well maintained and stocked. Since we are private owners, we provide more than required by rental agencies. We also make it easy to book with us! In addition, our condo complex offers many amenities in addition to the beach - tennis, 2 shuffle boards courts, 2 pools and small community gym and club house. We are centrally located to grocery stores, churches, restaurants, bars, and old St. Augustine. You can sit back and relax with a ice cold beverage and take in the Florida weather, watch a game of tennis or walk our beautiful beaches. Ocean Village Club is also a private gated community. The condo association does a great job in maintaining a resort-like feel and providing a clean, quiet, and quaint experience for all ages. We make it easy to book with us and are happy to answer any questions you have about our condo and/or St. Augustine. Beachfront complex. Our condo is not beachfront and does not have a beach view, over looks tennis and 1 of 2 pools. Beachfront complex. Our condo is not beachfront, over looks tennis and 1 of 2 pools. Oceanfront complex. Our condo is not oceanfront and does not have a ocean view, over looks tennis and 1 of 2 pools. High speed internet in our condo with wireless. Located in the club house. Computer available in community center club house. Flat screen TV in living room and master bedroom. Flat screen TV with cable in living room. Flat screen TV with cable in master bedroom. Library located in club house. 2 pools, one heated in winter. Two Pools (shared), Tennis Courts, (Club house with library, computer with DSL and exercise room). Flat screen TV with cable in living room. Flat screen TV with cable in Master bedroom. Free WiFi and high speed internet in our condo. King size bed in master. Wonderful location to beach. Very clean and provided ewerything I needed. Spotlessly clean, loved the balconies and views, loved the location. The only mild negatives which we adjusted to; It is quite a walk to the beach. Might be challenging with smaller children and gear. The same is true of the lack of an elevator on a 3rd floor property. We had a wonderful time in St. Augustine! The condo was perfect, very clean, located very near the beach, restaurants, and downtown. We walked the beach every night and even saw a huge sea turtle! Historic St. Augustine is everything a history buff could ask for and the beaches were beautiful. Definitely would recommend this condo to stay in. The host is informative and maintains a perfect home away from home. Clean and tidy condo - Great location at a perfect price! . The condo was extremely clean and the entire complex well kept. We have stayed at Ocean Village Club three times and are so pleased with how well the place is being maintained. We love the location. Kathy was extremely flexible and easy to work with. She was willing to make last minute changes. Her building was in a very quiet location of the complex and still very close to the beach. It was a great week! One needs to be aware that Ocean Village Club isn’t the Ritz but the location can’t be beat and Kathy’s condo is very nice and perfect for our needs. This unit is furnished with good taste and looks more like a unit occupied by owner than a rental..
For me, nothing begins a good getaway better than an environment with everything your own home might have: relaxing furniture, beautiful décor, a well-equipped kitchen, comfortable beds and plenty of clean linens. This is that place. We found this lovely condo as we were looking for a temporary month long “stop off” until our home we were building was finished. Coming from the upper Midwest and living with very sketchy deadlines and timelines, we arrived stressed, emotional and in need of rest and refreshment. It took only minutes to discover that we had found the right place to restore and enjoy the beautiful island. It was clean, well equipped, and the grounds were in excellent condition as were the pools decks and chairs. The unit is only a short walk to the beach and shorter to the nearest pool, yet, there is no concern of noise or traffic in either case. The unit is also equipped with additional “toys” for the beach. We were quick to settle in and begin unwinding and preparing for our new life in Florida. Enter the unexpected visit of a historic, major hurricane which chased us off the lovely island and into Augusta, GA. Our much-needed rest was only about a week along, and our month was cut short a whole week (as was our sense of rest). In the midst of newly added stress of another move, Kathy checked in, made herself available, offered much needed advice and reassurance. Above and beyond any necessity or expectation to do so, she offered us the wonderful gift of an extra week to our reservation. This became even more valuable as we would not close on our home in the time we’d reserved the condo for, and would have had to have found yet another place to move. Throughout the experience, Kathy’s hospitality ended up being the icing on the cake, even as she had to deal with the hurricane’s personal impact on her. Even with a devastating hurricane, our time in this condo will always remain a wonderful memory and a tremendous welcome from someone who started out as a “renter” and ended up being a kind introduction to Floridian life and neighbor. I cannot endorse this experience with any more enthusiasm. Any one renting this condo will have everything they need for a great vacation with an owner who is invested in making sure it can happen.